Under Arizona’s A.R.S §13-3415, it’s illegal to use or possess illegal drug paraphernalia. Any item used to make, prepare, measure, store, contain, inject, ingest, inhale, or consume illegal drugs may be charged. Common paraphernalia items include containers, baggies, pipes, bongs, scales, foil, bowls, capsules, papers, spoons, straws, needles, and grinders. A prosecutor’s office can charge drug paraphernalia as either a class 6 felony or a class 1 misdemeanor. If your criminal case is in the superior court, the paraphernalia charge is a felony. Conversely, if it’s in a city or justice court, the charge is a misdemeanor. What are the penalties for Drug Paraphernalia in Arizona? The potential penalties depend on whether you’re charged with a felony or misdemeanor. Below is summary of misdemeanor versus felony drug paraphernalia. Misdemeanor Drug Paraphernalia in a City or Justice Court. When police only recover drug paraphernalia, without a “usable quantity” of illegal drugs, the paraphernalia will be charged as a misdemeanor in a city or justice court. A misdemeanor paraphernalia charge carries up to 6 months jail, $3600 in fines and surcharges, 3 years probation, and drug related counseling, treatment, and classes. Fortunately, Arizona’s Proposition 200 offers protection from jail time for most Defendants. Under Proposition 200, jail cannot be imposed on non-violent first and second time drug offenders. Instead, a Court will only impose probation with fines, treatment, classes, and counseling. Most city and justice courts have drug diversion or deferred prosecution programs for those with a limited criminal history. The benefit of diversion or deferred prosecution is that you can avoid a criminal conviction, so long as you successfully complete a drug program. The prosecutor’s office has the sole discretion in allowing a Defendant to participate in diversion or deferred prosecution; as such, it’s important that your attorney advocate for these options. Felony Drug Paraphernalia in Superior Court. A felony drug paraphernalia charge is a class 6 felony. Practically, it will be accompanied by at least one other drug possession charge: marijuana, narcotic drugs, or dangerous drugs. Narcotic and dangerous drug charges expose a Defendant to harsher penalties because they’re class 4 felonies. Arizona’s Proposition 200 affords protections for felony drug possession and drug paraphernalia charges. It provides that jail cannot be imposed on first or second time non-violent drug offenders; the Court may only impose probation with fines; community service; and drug treatment, classes, and counseling. Proposition 200 doesn’t apply if you have two prior drug convictions, if you have a violent criminal history, or if your case involves methamphetamine. If you’re not Prop 200 eligible, you face up to one year jail with probation, or between four months and 5.75 years prison. The specific prison range depends on your criminal history. Common Resolutions in Felony Drug Paraphernalia Cases. PLEA BARGAIN:When the felony paraphernalia is only associated with marijuana, the charges can often be reduced to a misdemeanor marijuana offense. The terms of such a misdemeanor agreement will usually include unsupervised probation, random drug testing, and 8 hours of drug education. When the felony paraphernalia is associated with dangerous or narcotic drugs, the charges can often be reduced to an undesignated felony. An undesignated felony means that the conviction can be changed to a misdemeanor upon successful completing of probation. In short, you can walk away with a misdemeanor on your record. TASC DIVERSION: TASC is a common resolution in simple possession of drugs and drug paraphernalia. TASC is a 3 to 12 month treatment program. Upon successful completion of the program, the charges are dismissed and there’s no criminal record. TASC diversion is within the sole discretion of the prosecutor’s office. In many cases, a defense attorney can negotiate TASC for those with a limited criminal history. When TASC is agreed upon, you must meet with a TASC representative at the courthouse and make a written admission to the charges. Thereafter, there’s a mandatory 3 hour drug education seminar, periodic drug counseling, and a random drug tests. TASC has two drug programs: (1) marijuana; and, (2) non-marijuana drugs. The marijuana program involves a three hour drug education seminar, about 3 to 6 months of drug screening, education, and counseling, and $1,000 in program fees. Payment plans are available. While the marijuana program call for 6 months, many clients report finishing in as little as 3 months when program fees are paid early, complete all classes, and test negative for drugs and alcohol. The TASC program for non-marijuana drugs takes 12 months. The costs is about $2400 with payments of about $200 each month. The exact costs will vary slightly based on the type of drugs in your case. The program consists of a drug class, random drug tests, and periodic counseling. Missed appointments or untimely payments will delay completion of the program. Failure to attend the seminar or counseling sessions can result in your dismissal from the program; furthermore, drug tests that demonstrate illegal drug use or alcohol consumption will lead to dismissal from the program. The only exception for drug use is if the Defendant provides a current medical marijuana card and doctor certification. Similarly, a Defendant may test positive for legally prescribed medication. Upon successful completion of the TASC program, your case is dismissed leaving you with a clean record. However, if TASC isn’t successfully completed, you must return to Court and the case is reinstated for further prosecution. For most Defendants, the TASC program is preferred over a plea agreement because it avoids a criminal conviction. In addition, it can take 3 to 12 months rather than the usual 1 to 3 years of probation. Also, the costs of the program are less than the fines and fees associated with probation. Even if your only goal is getting into TASC, it’s wise to hire a criminal attorney. Felony court can be confusing and intimidating. Having a criminal defense lawyer streamlines the process and protects your interests. Your attorney can ensure that you’re not taken advantage of by the prosecution. Additionally, TASC diversion has particular requirements; having a Mesa AZ criminal defense lawyer to consult can avoid common pitfalls. If a Defendant is dismissed from TASC for non-compliance or non-payment, a criminal lawyer can sometimes advocate for reentry into TASC by explaining mitigating circumstances. The item is not used for illegal drugs. Some devices are used to ingest legal or prescribed substances, such as tobacco, medical marijuana, and prescription drugs. Drug paraphernalia must be firmly connected to an illegal use of drugs. The Item is Not Drug Paraphernalia: The statue sets out a clear criteria of things to be considered in determining whether something is drug paraphernalia. The following can be considered by the fact finder: statements, prior convictions, proximity, drug residue, evidence of intent to use, and expert testimony. Lack of Knowledge or Criminal Intent: The State must prove, beyond a reasonable doubt, knowing possession of drug paraphernalia. There’s many explanations or reasons someone may not know about drug paraphernalia on their person, among their belongings, or in their car or residence. Constitutional Violations: Search and seizure, Miranda, lack of probable cause, lack or reasonable suspicion, illegally obtained statements, illegal warrants, right to counsel violations, involuntary statements—these can provide for the suppression of evidence and a dismissal. Fruit of the Poisonous Tree. Any evidence that’s obtained as a direct result of an unconstitutional police investigation must be suppressed—this includes any testimony, physical evidence, and admissions. Insufficient Evidence: Especially in cases involving constructive possession, the State must prove, beyond a reasonable doubt, that a Defendant knowingly possessed drug paraphernalia and intended that it be used with illegal drugs. No illegal drugs recovered. While the State doesn’t need illegal drugs to prosecute for drug paraphernalia, it shows doubt in the State’s case. Medical Prescription. Paraphernalia used in connection with a valid medical prescription is not illegal. Arizona’s Medical Marijuana Act: A qualified medical marijuana patient may have up to 2.5 ounces of marijuana and up to 12 plants. If a Defendant is charged with possession of marijuana, despite having a valid card, the charges should be dismissed. The Paraphernalia Belongs to Someone Else. It’s common for there to be multiple people present in a drug investigation. It’s also common that more than one person has access to the location where the paraphernalia is found. CALL or TEXT Tobin Law Office for a Free and Confidential Consultation about Your Drug Paraphernalia Case. 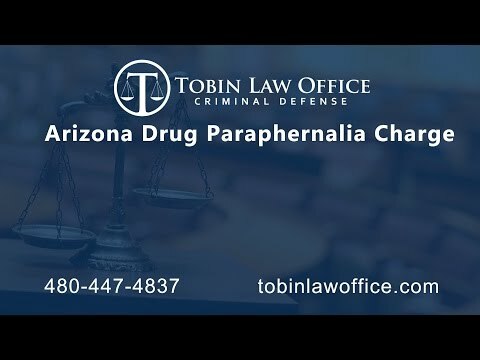 When facing a drug paraphernalia charge, TEXT or CALL 480-447-4837 Tobin Law Office. We can guide you through the daunting criminal process and explain how to avoid a conviction for drug paraphernalia or drugs. Our consultations are free, friendly, and confidential. There’s never a sales pitch. Prospective clients are often surprised by how affordable it is to hire us for drug paraphernalia charges. Drug Paraphernalia, and drug possession, are some of our most affordable services due to the consistency in outcomes and criminal procedure.